Cape Town – Noticeably poor performances or even just going through the motions in specific games are going to prove increasingly costly for Springbok loose forwards from now onward to the 2019 World Cup in Japan. We are inside the last two years of build-up to the next premier global tournament, which begins on September 20 that year, so planning for it naturally intensifies from here. The Boks are in significantly greater disarray at coaching level than they would like, with Allister Coetzee clinging by a fraying string to his senior position, and inevitable talk of significant changes in the 2018 Test season when Rassie Erasmus gets stuck in more fully to his Director of Rugby role. But that shouldn’t too hugely affect the clamour among players to get into line for spots in the RWC squad, and one place where the tradition of fierce South African positional competition is rapidly being restored is at loose forward. 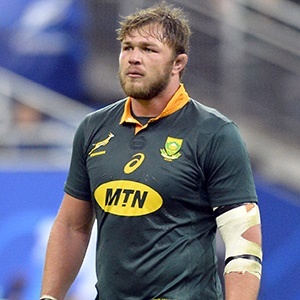 The situation only hotted up last weekend when known heavyweight figure Duane Vermeulen made his pretty successful comeback after a long absence – some 17 months - to the No 8 berth against France. The 31-year-old did enough in the slugged-out Paris victory to suggest that his appetite for international rugby remains suitably strong, and that he clearly earmarks a probable swansong World Cup in the Far East. Immediately, too, that situation poses the red-letter question: what is the ongoing status of currently injury-rehabbing incumbent Warren Whiteley as first-choice captain? The Lions skipper is expected back at his franchise-level post for the start of Super Rugby 2018, and for a brief period while the Boks sparkled in June (the home series against France) this year and he was still fit, Whiteley led admirably -- and from the front. But is he even still earmarked for the national captaincy, when Erasmus takes greater charge of things, ahead of the important 2018 June series against England on our soil? Whiteley and Vermeulen both sport fine leadership credentials, but they are very different beasts at eighth-man in playing style, with the former a more mobile stepper and playmaker, and the latter famed for his ton-of-bricks physicality. Nevertheless, it will just be positive for the Bok cause next year if they have both men available for a specialist berth that has had to be filled by makeshift customers recently like Francois Louw and Uzair Cassiem, both more familiar with the side of the scrum. If Whiteley keeps the captaincy into next year, it will open up very feasible possibilities for Vermeulen (his 118kg, 1.93m frame extremely suitable) to operate at blindside flank, where he began his Stormers career – Luke Watson was the captain and No 8 at the time – and with plenty of aplomb. By extension under that scenario, the No 7 jersey becomes an increasingly compelling duel as well, given the presence also of such healthy counter-options as 22-year-old Sharks powerhouse Jean-Luc du Preez (10 Bok caps thus far, usually as an impact presence), Cassiem and now the increasingly versatile Pieter-Steph du Toit. Only this week, in the lead-up to the Italy Test, Bok assistant coach Matt Proudfoot was talking up Du Toit as a possible legend-in-the-making at flank, suggesting he had both the physical presence and range of skills to match the likes of Gert Smal, Theuns Stofberg and Juan Smith at seven. But then there’s also the vexing – again - Siya Kolisi matter: is he slowly being remodelled back to a “seven” role? I thought he played some of his best ever Test rugby earlier this season when he operated at open-side. But with Coetzee also being seduced into restoring Bath-based veteran Louw to his favoured frontline fetcher berth (No 6) more recently, Kolisi changed to the other side against France and fared well enough despite not being the biggest unit to grace a No 7 shirt. It helps when you have a figure like Vermeulen offering brawny aggression at No 8, and many pundits lauded the balance of the loose trio against France, with Louw at six, Kolisi seven and Vermeulen at eighth-man. Should the more rangy, lighter-weight Whiteley eventually be restored to No 8, however, then Kolisi staying at blind-side becomes a more contentious issue all over again: would the Boks have enough grunt in their loose trio under such circumstances? A future for Whiteley as No 8 and skipper suggests to me that Kolisi would instead be challenging more again for the stealer spot, along with Louw and, next year, genuine tearaway factors like the Lions duo of Jaco Kriel (once back in action) and Kwagga Smith. Kriel is another versatile factor who could serve blindside, as well as his more familiar No 6, if the eighth-man is a bruiser like Vermeulen and the fetcher is also a forceful carrier and mauler. But there’s also still that multi-talented loose forward Marcell Coetzee of Ulster to consider, once he is back from own, further injury setbacks. Big-hearted former Sharks workaholic Coetzee is still only 26 and already possesses 28 Test caps; he is a valuable “squad” man because he arguably offers viable cover in all three loosie berths. Come 2018, the Springboks should find that they are really spoilt for choice – in what would be a firm revisit of a once-proud trend – in those areas.